This morning I’m on my way to back to Austin, Texas, but last night our old friends Dororthy and Greg Patent stopped by on their way south for dinner and a couple of nights on the farm. Dorothy has written over 130 books. (Go to her link on my home page). Greg has written many cookbooks and has won the James Beard award. I’ve known Dororthy for over 20 years and she is directly responsible for me getting my first book “Sea Otter Rescue” published. 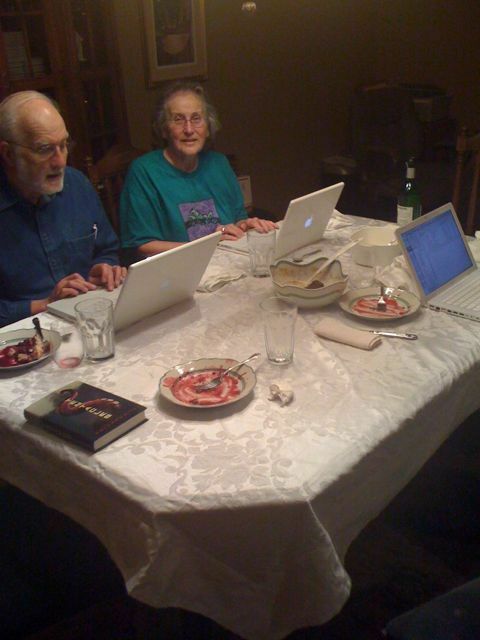 They are pictured below at the dining room table after dinner in what looks like a Mac attack. thank you for coming to Viroqua middle school in Wisconsin. I’m pretty sure everyone had a super uber fun time. I know I have enjoyed your books and your funny jokes!!!!!! so long I will see you later today!